What could Pilates possibly have to do with functioning well in this kind of environment? There is a Pilates exercise called “Mountain Climber.” It is done on an apparatus called “The Chair.” When I was first being taught the beginner version of this exercise I thought “this will be a piece of cake, after all I am a climber”. I was surprised to see the weakness the exercise revealed in my ability to step up and balance on this chair with its spring loaded pedal. Like many Pilates exercises, Mountain Climber requires an athlete to fully commit to the movement from their core, to use all the muscles of the leg (not just the quads,) and to do so while their balance and proprioception are challenged. Also, like many Pilates exercises this one gets progressively harder as the resistance of the apparatus is reduced, forcing the athlete to move and control their body weight more. My own experience is this. Pilates will not help a mountaineer with aerobic fitness, altitude training and technical skills. What Pilates will bring is the strength and toughness to take a beating – something the mountains are always able to deliver. A little slip when tired is less likely to cause a pulled muscle or more severe injury. Moving over difficult terrain with a heavy pack is easier. Cleaner, more efficient movement leads to improved endurance and speed. Something Joseph Pilates talked about was how a person should be able to use 25% or less of their strength for almost everything they do, keeping the balance in reserve for an emergency. On a mountain this reserve could be the difference between life and death, for example having to regain one’s balance to avoid a fall. 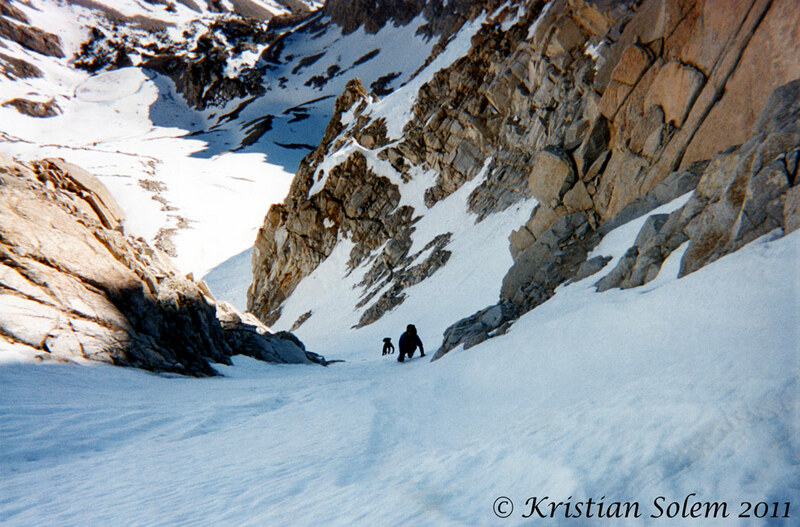 In the picture below Larry, Craig and I are climbing the northeast couloir on Mount Humphreys, again in the California Sierra. We are in a race against the sun. The perfect “neve” snow we are climbing is like frozen Styrofoam, offering a good purchase for the front points on our crampons and allowing us to move as fast as our physical conditioning allows. When the sun comes around the snow will soften, making the climbing slow and dangerous. When we stood at the base of the couloir after a long approach in the wee hours of the morning we understood the situation. 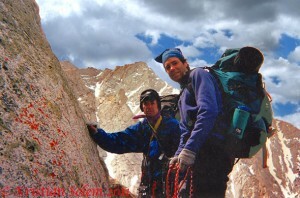 The decision was taken to keep the ropes in our packs for speed and go for it. We did rope up for some sections on rock above, and to descend from the summit. It was a great day!